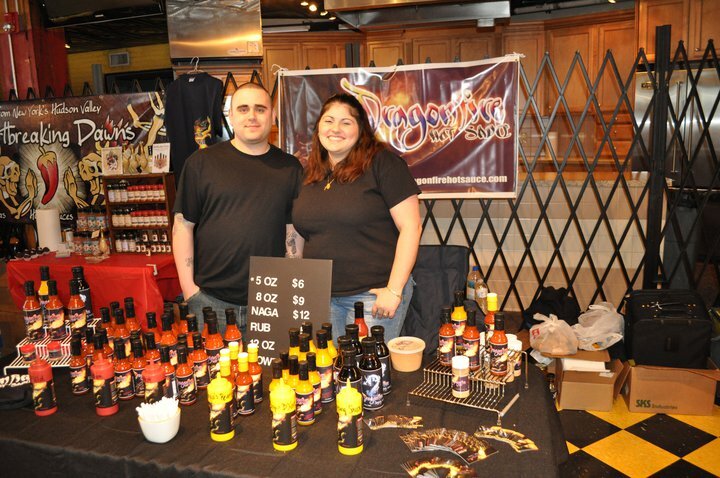 We first met Rick and Maria Villafrade of Dragonfirehotsauce.com at the Bowers PA Chile Festival in 2010, where they were sampling and selling their very first sauce. Yes, one sauce. 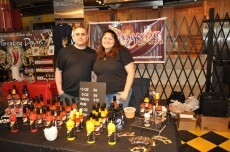 Now they have 8 sauces and are poised to be a serious hot sauce contender! 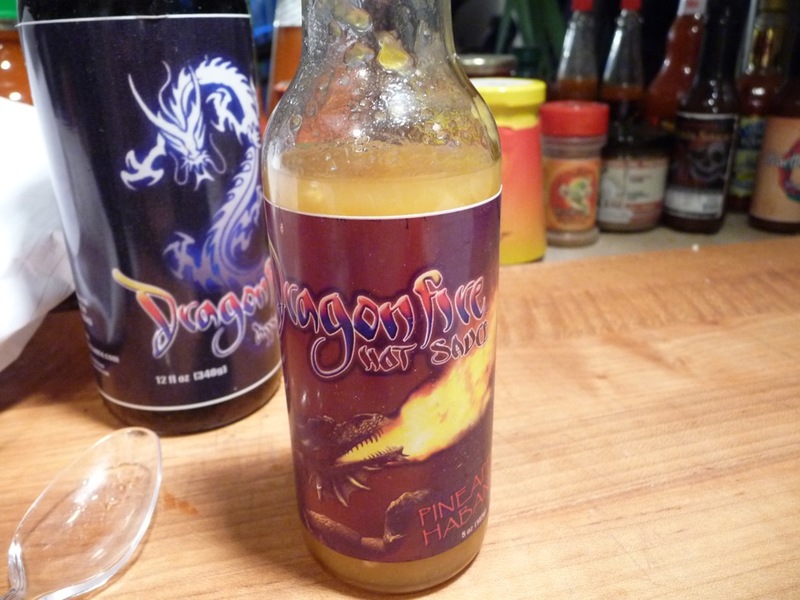 We featured them on our podcast, HotSauceWeekly 037 Dragonfire Hot Sauce. 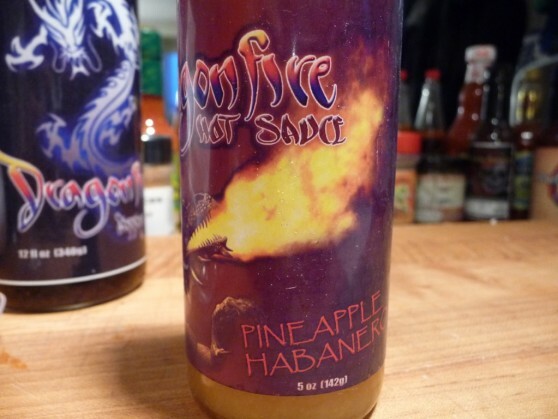 Here is our review of one of their newest sauces, Pineapple Habanero Hot Sauce. Brian: – medium thick with a chunky texture that clings nicely to the sides of the bottle. A bright orange/yellow color reflects the pineapple and habanero ingredients. The aroma brings on a strong garlic smell. I love garlic but I don’t think it works in this sauce. Marilyn: – This sauce has a lovely deep yellow color, reflecting the inclusion of pineapple in the sauce. 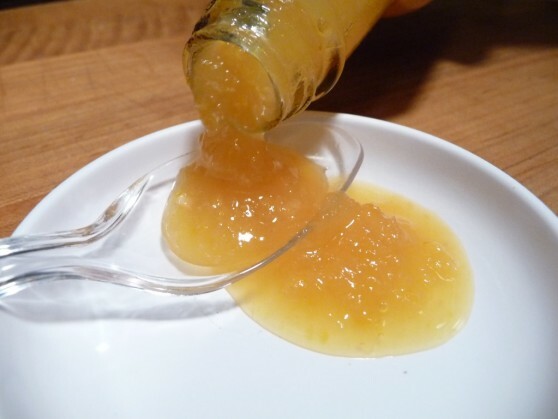 It reminds me of my favorite Duck sauce, and the texture is that of crushed pineapples in syrup. A little bit of run in the saucer, but not too much. Very nice. Brian: – Big bright taste of a sweet habanero sauce with lots of crunch from the onions and peppers and garlic. What follows though, is a sharp, acidic taste that I blame on the garlic. It’s just a tad bitter to me – probably the garlic is to blame. Marilyn: – A little sweet, big garlic hit, and some noticeable heat. The heat spreads quickly through the mouth and leaves a nice mellow warmth. The pineapple is there at first taste, but dissipates quickly. I would love to have the sweetness of the pineapple last longer. Brian: – For a habanero sauce, the heat is on the mild side. The burn comes on quick and lightly and does not linger. Marilyn: – The heat level is very pleasant, and won’t hurt you. It’s spot on for me, and I like the fact that you could eat more and more without getting “burned” out. Brian: – The label is reminiscent of a dragon from a World of Warcraft type game. The dragon pic is washed out and just doesn’t “pop” for me. I do like the graduated colors on their font. I agree with Marilyn that the actual sauce name, “Pineapple Habanero”, needs to be more prominent. Marilyn: – The label is nice, and the flame from the dragon’s mouth really stands out. I’d like to see a different color for the background OR for the dragon, as the two are too similar to make the dragon graphic really pop. I’d like to see the ‘Pineapple Habanero” moved toward the center, as you really can’t see it when you look at the bottle as it would be displayed on a shelf. Brian: – I really thought this sauce would rock on pizza, but I couldn’t get over the sharp, tangy and almost bitter aftertaste. I fully blame the garlic. Having said that, if you are into the whole “hot sauce on ice cream” thing, then this may be a dessert hot sauce for you. Personally I’m not, and I’m a little disappointed in this sauce. I had high hopes, and would suggest they get rid of the garlic. Marilyn: – I loved the initial taste, but the garlic really overpowers the pineapple. As much as I love garlic in my sauces, you could cut it out (or lower it considerably) and still have a fantastic sauce. Keep the heat level exactly where it is, as I could eat (and buy!) a lot more of this sauce. Have you ever tried Hobo Howey’s pineapple jalapeno chutney? It probably doesn’t have the heat level you like, but I like it. We do have some Hobo Howey’s sauces here. Guess I’ll have to break that one out real soon! Thanks.